reacted on the issue of meeting between Navjot Singh Sidhu and Gopal Singh Chawla, Pro- Khalistani in Pakistan in his recent visit. “Navjot, now a days is behaving very negatively in context of the nation. Such malicious tactics on Pakistani soil can not be ignored. Rahul Gandhi is not speaking anything related to the issue and Imran Khan himself declared that Rahul Gandhi far away from PM’s seat . 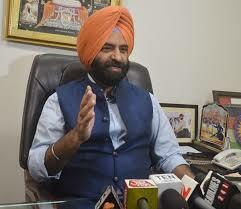 Manjinder Singh Sirsa is an Indian politician and member of the Shiromani Akali Dal. Sirsa is a member of the Delhi Legislative Assembly from the Rajouri Garden as a Bharatiya Janata Party in 2017 by poll. Sirsa is also elected member and general secretary of Delhi Sikh Gurdwara Management Committee. Pakistan’s army chief General Qamar Javed Bajwa was also seen greeting Chawla warmly on the sidelines of the function on Wednesday.